I just downloaded You Are a Writer (So Start Acting Like One) for FREE on to my Kindle. 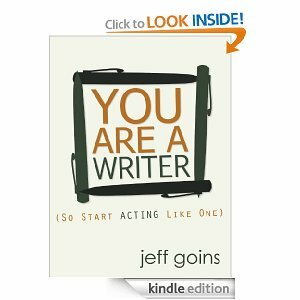 The author Jeff Goins says, “This is an eBook about a journey of becoming a writer. It’s a guide to writing and publishing, including how to navigate the world of platform-building and getting your work noticed. Mostly, it’s about believing in yourself. About the process of self-doubt we all go through and the declarations we make to do what we’re made to do”. You can currently download You Are a Writer (So Start Acting Like One) for free . I don’t know how long it will remain at this price, so check the price before you buy it. You don’t have to have a Kindle to take advantage of these deals. You can download Free Kindle Apps for your Computer or Smart Phone . Earning money through monetizing your blog can take time. So today I wanted to tell you of another way that you can earn money while you are figuring out which ads and affiliate programs work for your audience. It still involves your blog though. You can trade on your blog’s credibility to work as a freelance writer. Your blog is an easily accessible display of your writing capability and your knowledge on specific subjects. Even if you haven’t worked as a freelance writer before, you can cite your own posts as an example of your work. Once you have written a few articles for other blogs or magazines, you can cite those articles in addition to your blog. Where can you find work as a freelance writer? I landed my first freelance job on the recommendation of a friend and it was based on my knowledge of Greek. How obscure is that? I share it so that you don’t set self-imposed limits on the topics you think you can write about. You may have a skill that you take for granted that will prove useful to a specialized audience or magazine. That Greek article led to a great job that paid off our truck. Almost every magazine has contact information online or in their magazine. They usually just provide a name and email, but occasionally provide general guidelines for writing for their publication. Print magazines generally pay much better than blogs. For more information, read this thorough article on How to Get Paid to Write for Magazines. I often see people looking for freelance writers on Twitter. I recommend following the blogs and magazines you are interested in writing for on Twitter. You can even create a list, so you can easily scroll through their tweets. This will give you a heads up on the topics they are interested in or their writing needs that you can fill. Have you worked as a freelance writer? Share your experience in the comment section.